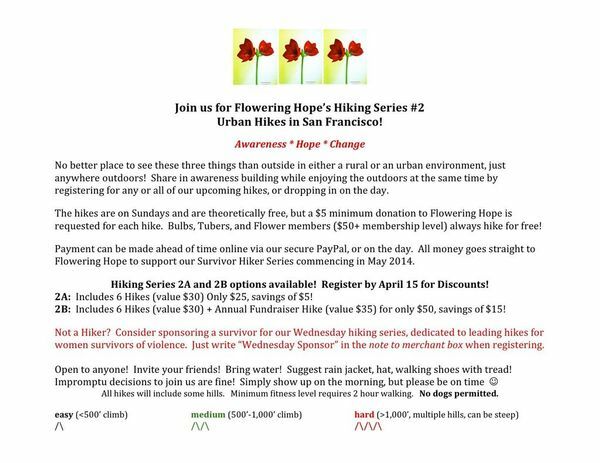 Be outdoors, explore your city, meet new people, have fun, AND support a great cause when you join Flowering Hope's Hiking for Hope Series #2 - San Francisco Urban Hikes! Open to interested women and good men who value and support women as equal partners. Flowering Hope's Hiking for Hope Series #2 is made up of 6 prescheduled urban hikes around San Francisco's Presidio, the city's stairways, and parks. The $5 minimum donation requested for each hike goes to support our Survivor Hiking Series, a new program dedicated to leading hikes for women survivors of violence. You can preregister, get hike details, and fill in our online hiker information/release form for all 6 hikes at Hiking Series Registration (http://www.floweringhope.org/hiking-for-hope-series.html). Flowering Hope (http://www.floweringhope.org) is an awareness and support organization for women and girl survivors of violence. Our MISSION is to serve and empower women and girls survivors of violence, providing a venue for her voice to be heard and an opportunity for healing through creative means. Our GOAL is to raise awareness of violence against women and girls as a frequently occurring issue that has existed in society over time and crosses all geographic, economic, religious, cultural and age barriers. 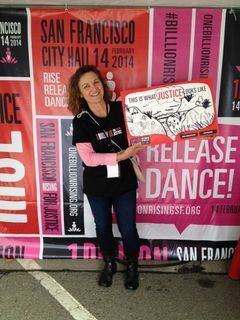 Our VISION is a world where women and girls are free from violence. We operate under the belief that increased awareness leads to hope and ultimately, change.